Git is a powerful tool. Once you’ve mastered commit and merge, there are endless possibilities. A very useful one is git-bisect. It helps you find a commit that introduced a certain change in behavior. When you find a regression, something broken that used to work, use git-bisect to find the commit that broke it. Mark the current commit as bad and mark an old commit, where that feature still worked, as good. Git-bisect will then bisect all the changes between those two commits with a binary search. At every step, you are asked to mark the commit as good or bad until bisect finds the first bad commit. npm test   #  Double check that this commit is broken. git log --oneline   # Find the hash of a good commit. git checkout 7425633   #  Checkout that good commit. npm test   # Double check that everything was green. Bisect uses binary search, so the range decreases exponentially. Every step cuts the range in half. If you bisect twice as many commits, it takes one additional step on average — not twice as long. Thus bisecting large ranges of commits is fairly quick. Git bisect view. The range of commits to test is cut in half at every step. We use git-bisect a lot in the Node.js project. The Node.js project has good continuous integration but some bugs are only discovered after a release. With git-bisect, it’s easy to find the bad commit. 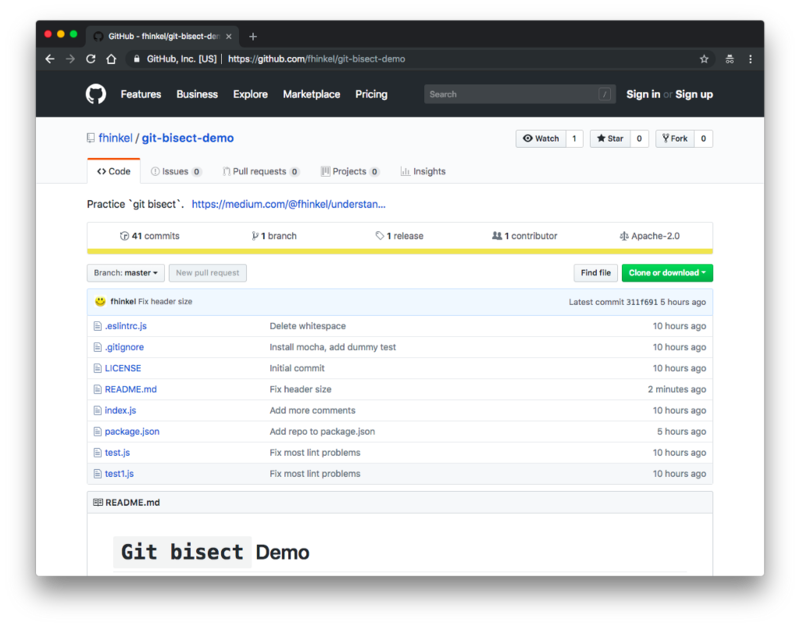 If you want to try out git-bisect, here is a demo repository. At some point, a bug was introduced as you can see by running npx mocha test1.js. Can you find the bad commit? Use this repository to practice git bisect. 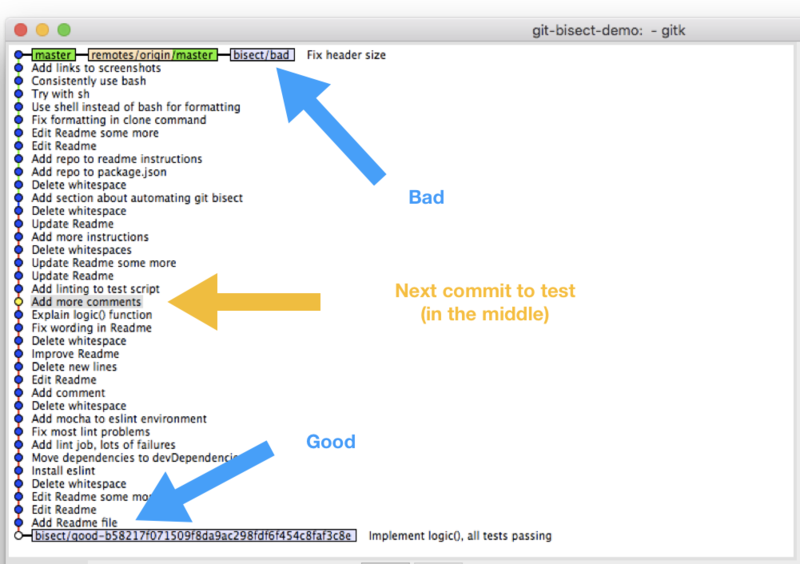 Instead of testing each step manually, you can run git-bisect with a script. It will use the script at each step and automatically mark the commit, until it finds the first bad commit. Understanding Git-Bisect, i.e. Use Binary Search to Find the Change that Introduced a Bug was originally published in Hacker Noon on Medium, where people are continuing the conversation by highlighting and responding to this story.